The carotid artery is a blood vessel located on each side of the neck. 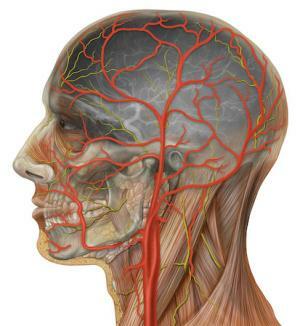 It carries blood to the brain and also supplies the structures of the face. Narrowing of the carotid artery generally occurs due to atherosclerosis and its blockage can result from additional build-up of blood clots. The most common symptoms and signs of carotid artery blockage include dizziness, fainting, severe headache, blurred vision/ loss of vision and confusion. A patient may also experience a mild stroke and have speaking and swallowing difficulties. Carotid artery surgery is a surgical procedure performed to restore the flow of the blood rich in oxygen and glucose to the brain in patients suffering from carotid artery blockage. Carotid artery blockage can be successfully treated with endarterectomy and angioplasty (with stent placement). Carotid artery blockage surgery or endarterectomy is performed under general or local anesthesia. The surgeon reaches the affected artery with a cut on the neck exactly over the carotid artery. Until the affected part of the artery is cleaned a flexible tube is placed in the place of the carotid artery and it transfers the blood during surgery. The affected part of the carotid artery is treated with plaque removal and the artery is closed with stitches. It is essential to monitor heart and brain activity during the entire procedure. Carotid angioplasty and stenting are not invasive as carotid artery blockage surgery. In this case the patients are administered relaxant and numbing medications. The surgeon makes a cut in the groin area and inserts a catheter into an artery. The catheter is led to the neck with the assistance of specific X-ray called fluoroscope and finally once the blockage is identified a guide wire is passed through the catheter. The guide wire is essential for passing over a catheter with a tiny balloon. The balloon is blown up and it mechanically removes the plaque. This way the carotid artery restores its normal diameter. In some people a stent is inserted together with the balloon catheter and left in place of the blockage. The role of a stent is to expand when the balloon is blown up and it additionally keeps the artery open. At the end of the procedure the balloon is deflated and removed. The most common risks associated with carotid artery blockage surgery include heart attack, brain damage, allergic reaction to dye used during the procedure and formation of blood clots or bleeding in the brain. In rare cases the patient may develop seizures and stroke after the surgery. It is possible that the blockage becomes even more severe after the surgery (which generally occurs after certain period of time). Treating renal artery in stent restenosis? What other heart problems, beside stroke, can carotid Endarterectomy prevent? What increses risk of stent thrombosis?